Every organization, at some point, needs to delve deeper and gain insights on their projects to understand where they stand. From NGOs to large organizations, every business is involved in time-sensitive projects that need to be intermittently examined. Here are some interesting facts about project reports. According to Chaos theory, only 50% of project managers can see who has read, changed or downloaded a project document. Whether you want to find out if a particular group or an individual is meeting performance target or you want to find out loopholes in a project, Docsvault provides built-in individual and manager level workflow reports to enable you to assess the efficiency of your workflows and related business processes. You can use these reports to locate problems with processes or to establish performance standards and review them. Here are three ways you can use Docsvault for greater sense and control over projects. 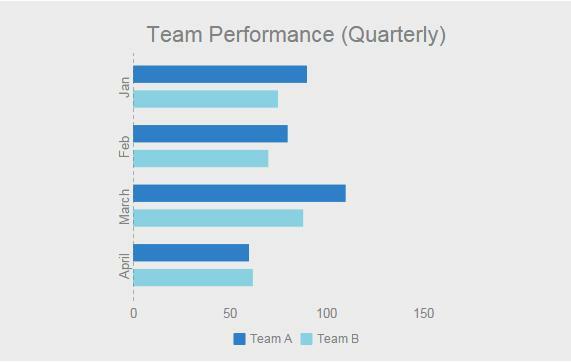 How will you evaluate team or individual performance without actually having standard performance metrics? The first step is to determine a standard for all parameters such as group tasks, individual tasks, daily progress and workflow steps. Let’s say you have two teams of 8 working on similar kind of projects. Your Team A is showing stellar performance and Team B is not. The first step would be to see if the performance of Team B is meeting standard performance rating or not. If yes, then you need to dig deeper to find out key problem areas so you can boost the efficiency of Team B and push them to the level of Team A. As per this chart, Team B has regularly failed (3 times) to meet average performance of 80 points, clearly posing a problem. No project runs smoothly from the start. Some hiccups and loopholes are bound to be there. The best way to understand where your team is failing is to have a step by step breakup of all tasks and understand which particular step in workflow is the root cause of problems. One of the classic mistakes for snail-speed projects is unclear classification of high priority and low priority tasks. This can lead teams to exhaust all their energies in low priority tasks. Workflow breakup can allow project managers to address this problem by clearly outlining priorities. Sometimes, getting approvals might be the problem factor, which might pinpoint to grey areas in project leadership. Workflow reports can help companies to meet their long term goals by carefully planning their small, short term goals. They are also important from e-discovery, legal and security point of view. Docsvault provides you with many different types of reports that help you monitor and maintain a tight control over your document management system and processes. To learn 101 common causes of project failure, we recommend this short blog. You can also get more information about Electronic Document Workflow.